Spin! 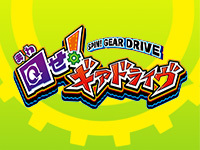 Gear Drive is available since yesterday. With this game, Konami incorporates the medal element into an arcade game. The player uses a rotary controller to shoot enemies appearing on the screen in order to win medals and items. Spin! Gear Drive is playable up to 4 in cooperative mode on 4 32" screens. 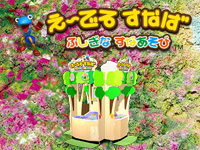 Players must cooperate to defeat huge boss and participate in several mini games. The last two titles in the Capcom games rerelease via NESiCAxLive campaign are available since yesterday. 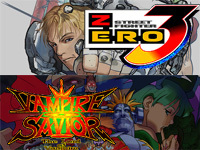 These are Street Fighter Zero 3 and Vampire Savior. As for the other titles, the display is widescreen with bands displaying characters moves on the sides. Players can save their name, number of points, rankings and number of KO on a NESiCA card. In Street Fighter Zero 3, hidden characters and game modes are unlocked from the start. 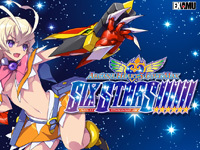 Arcana Heart 3 LOVE MAX SIX STARS!!!!!! Arcana Heart 3 LOVE MAX SIX STARS!!!!!! is released through NESiCAxLive today. A new character is now available: Korehara Minori. She comes with a new arcana: bloor ichor. All other characters and arcanas have been rebalanced. Players can choose between 6 new colors for the character costumes. Online rankings were reset with the game release. Sega will release an entirely new and original game for children tomorrow: Edel Sand. The very pretty cabinet features a real sandbox containing a special synthetic sand. Players can play with the sand to build forms and landscapes using Projection Mapping technology. Two game modes are available: dekiru kana for beginners to create landscapes and suna asobi, a harder mode to create shapes following the indications on the screen. 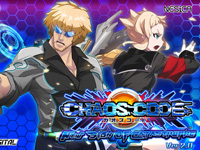 Japanese players can play Chaos Code - New Sign of Catastrophe Ver2.0 since Yesterday. Some bugs are fixed in these update and the game is compatible with the NESiCA Network Ranking. But the main feature of this update is the addition of two new characters: Lupinus and Ray. Lupinus is a speed character like Cammy (Street Fighter) and Ray is a more technical character. FK Digital made 2 trailers to present the new characters. You can watch Lupinus and Ray trailers. 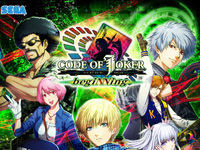 Code of Joker ver.1.3 begiNNing is available in Japan today. This update introduces a new costume functionality; Players can buy character costumes the same way they buy cards, the first costume being free. Sega plans to sell different costumes packs depending on the season in the future. Beside the new costumes, there are also 70 new cards added. A big "Master of Agent" tournament with ¥2.000.000 of prize money will be held in 2015. The qualification rounds are scheduled on March 14 and 15 at the Izumi Garden Gallery (Tokyo) and on March 21 and 22 at Umeda Sky Building (Osaka). The finals will be held at the Tokyo Big Sight TFT (Tokyo) on April 19. 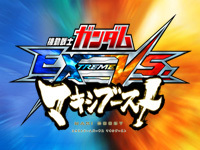 A new update of Mobile Suit Gundam Extreme VS. Maxi Boost is available today. Only one new mecha is added this time: the XXXG-01SR Gundam Sandrock from the 49 episodes animeted series Mobile Suit Gundam Wing broadcast between 1995 and 1996. It is piloted by Quatre Raberba Winner. If features the following equipment: Vulcan Gun, Heat Shotel, Beam Machine Gun, Homing Missile, Shield, Cross Crusher, Diffusing Cloak, Armadillo Armor, Self-Destruct System and Hovercraft Propulsion System. 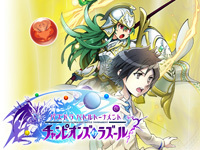 The Winter Battle Tournament will be held from December 6 to January 31. The players will compete to win emblems and winter decoration for the game interface. Puzzle & Dragons Battle Tournament -Champions of Razul- is the new version of the puzzle RPG of GungHo Online Entertainment and Square Enix. It will start operation tomorrow. Many new features and improvements are available such as a new interface, new monsters and ultimate evolutions. The players can now buy monsters in the monster shop with special stones. reflec BEAT groovin'!! Upper started operation in Japan yesterday. This is the sequel of reflec BEAT groovin'!! released in June. This new version adds a new Upper Gauge and Upper Points system used to unlock new customisation options. There are also a new expert mode available at the song selection screen. Two new clear gauges are also added: the Hard Gauge and the Super Hard Gauge. All locked/hidden songs in reflec Beat groovin"!! are still locked or hidden even if the player unlocked them in the previous game. The third title in the Sound Voltex game series is out in Japan today. 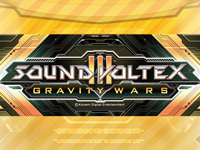 Sound Voltex Booth III - Gravity Wars features enhanced fullscreen graphics and 30 new songs (KONAMI Song Remixes, Original Songs, EXIT TUNES Licenses and Touhou Project Arrangements). Three songs received the "gravity" difficulty chart: PANIC HOLIC and TRIGGERâ˜…HAPPY from Sound Voltex Booth and ã‚µã‚¤ãƒãƒ¼ã‚µãƒ³ãƒ€ãƒ¼ã‚µã‚¤ãƒ€ãƒ¼ from Sound Voltex Booth II -infinite infection-.. The songs can be sorted in 4 categories: SOUND VOLTEX game (BOOTH, infinite infection et GRAVITY WARS), Cleared songs, ULTIMATE CHAIN cleared songs and PERFECT cleared songs.